The infantry soldier was sculpted by Johnson Marchant Mundy, who was legally blind when he created the figure. Mundy- was born in New Brunswick, N.J., in May, 1833- died in Geneva, N. Y., Aug. 16, 1897. Among his other works are a marble bust of Frederick Douglass, which occupies a conspicuous place in the capitol at Washington, D. C- a marble bust of Bishop Delancey, which has been placed in the new Episcopal church at Geneva, NY, one of the late Dr. Hale, dean of Hobart College. 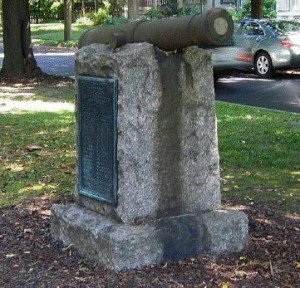 and one of Washington Irving in Tarrytown, NY. 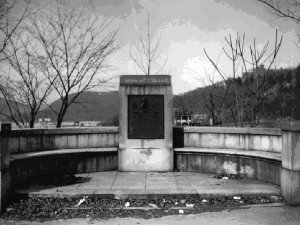 The memorial was later rededicated, again on Memorial Day, in 1933, at which time a second plaque was attached to the opposite side of the stone base – on this occasion honoring friends (Judge and Bedford Supervisor William H. Robertson) and comrades (the earlier-mentioned Private J.T. Lockwood and Captain James McKeel among them) who were charter members of this plaque’s sponsoring organization, McKeel Post No. 120, State of New York Grand Army of the Republic. It is situated among the trees on the Bedford Road divide near Parkway. The work was originally sponsored by one of the Company A volunteers, Private Jeremiah T. Lockwood, and dedicated May 30, 1914. The Lincoln Exedra was created to commemorate President Lincoln’s stop in Peekskill, NY in 1861 on his journey to his inauguration in Washington, DC. Therefore, it is not a Civil War Monument as such and its inclusion here is based solely on fact of its connection with the president who led the Union during the War and of whom it could rightly be said died for leading the fight to preserve it. The monument is located on South Street in Peekskill and provides a direct line for viewing the original train depot (now the Lincoln Depot) below to the West. The land was donated by John Smith Jr., a veteran of the Civil War and a President of the Lincoln Society from 1917-1918. It was designed by Peekskill architect, Gilbert H. Anderson and his artist brother, Victor C. Anderson. Antonio S. Renza built the structure with granite furnished by the Grenci &amp- Ellis quarry. The center of the Exedra contains a bronze portrait tablet of Lincoln that was created at the Tiffany Studios in New York City. The Lincoln Exedra, constructed in 1925 at a cost of $6,100, was paid for by donations raised by the Lincoln Society under then-society President Chester A. Smith. The land for the monument was donated by Civil War veteran John Smith Jr., and was designed by Peekskill Architect Gilbert H. Anderson based on a painting by his brother Victor. The foundation was built by resident Antonio S. Renza with marble donated by Grenci and Ellis from their Mohegan quarry. The bronze bust of Lincoln was created by Tiffany Studios of New York. 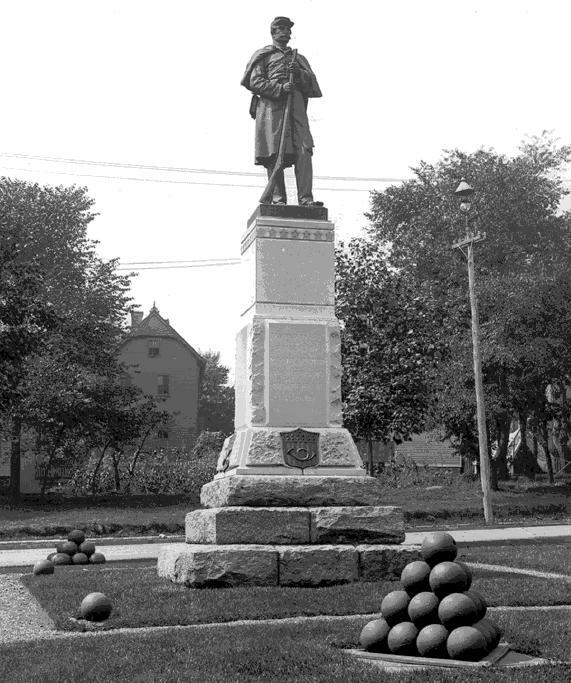 Soldiers’ Monument, Port Chester, N.Y. Port Chester, N.Y.’s 1900 Civil War Monument is located at a triangular park at the intersection of the Boston Post Road (Route 1) and Pearl Street. It features a bronze statue of a Civil War officer, Lt. Col. Nelson B. Bartram, a Port Chester resident who commanded the 17th New York Infantry Regiment before commanding the 20th Regiment of the United States Colored Troops. Bartram’s units saw action at Antietam as well as both Battles of Bull Run and the New Orleans region. It also has an eagle atop an ornate granite obelisk. The eagle is a 2008 replacement for the original, stolen earlier. The front face also features a bronze representation of a Grand Army of the Republic medallion. A plaque on the southeast face of the monument’s basereads: “To the Union Defence Committee of the Town of Rye who pledged their honor to sustain the government and ensure a successful outcome of the war of the rebellion.”Ornate scrollwork near the top of the monument features the U.S. seal, and the other faces are decorated with stone wreaths that surround Union Army corps symbols as follow: On the west face is a carving of a three leaf clover, the badge design of the Union Army 2nd Corps, Army of the Potomac. On the north face is a carving of a Maltese cross, the badge design of the Union Army 5th Corps, Army of the Potomac. On the east face is an carving of a crescent moon, the badge design of the Union Army 11th Corps, Army of the Potomac. There is a stone platform base with a bronze GAR star. fire departments, other civic societies and a chorus of 200 children paraded in the town of Port Chester, NY for the dedication. The statue was cast at the Abendroth Brothers Foundry a manufacturer of iron stoves, fancy yard pieces, hollow ware, planters, boilers, etc. in Port Chester. Southern Society and the United Confederate Veterans (UCV) to soothe the longings for home and to provide relief for needy Southerners in the North. 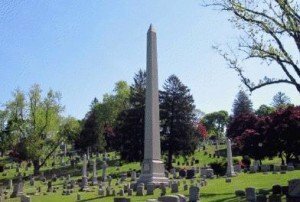 In the 1890s, the New York Camp of the UCV purchased a 400 square foot plot in Mount Hope Cemetery in Hastings, NY in which to bury its members. Among the most prominent of these graves is one that has the remains of General Edwin Selvedge a veteran of 30 battles and the last surviving veteran of the organization. Ironically, he was fated to die in a taxicab accident in Brooklyn, NY in 1930. Another interesting grave is that of Eugene H. Levy, a veteran of Donaldson’s Artillery. It displays the Star of David. The $5000 cost of the 60-foot obelisk was paid for a former blockade runner and 12th VA Cavalry Private, named Charles “Broadway” Rouss. After his war service he came to New York and prospered. He had a reputation as a womanizer who had an outsized ego and had other social faults but he was also a very generous man who gave millions to various causes, including all the costs of the monument. 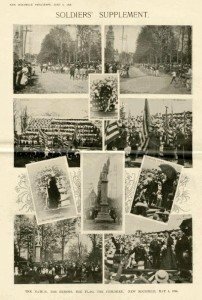 The principal speakers at the dedication on May 9, 1896 were General Daniel A. Butterfield and General Daniel E. Sickles. Both of these Union Army officers had impressive war records and were controversial figures thorough out their lives. Butterfield was born in Utica, NY and entered the Union Army with the rank of sergeant shortly after the Confederate attack on Ft. Sumter Service in April of 1861. 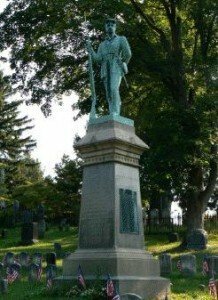 Within weeks of joining he somehow obtained the rank of colonel heading up the 12th NY Volunteer Regiment. By July, he commanded a brigade and by September he was a brigadier general. In the Seven Days Battles, at Gaines’ Mill on June 27, 1862, he was wounded and after the war (in 1892) he was awarded the Medal of Honor for his actions at that battle. During his convalescence, Butterfield experimented with bugle calls and is credited with composing, &#8220Taps&#8221, probably the most famous bugle call ever written. However, some musical historians maintain that Butterfield merely revised an earlier bugle call and did not compose an original work. Although he never attended U.S Military Academy at West Point, General Butterfield managed to construct an elaborate Egyptian pyramid-style tomb for himself there. Apparently, he had a fear of being buried alive and installed a coffin alarm in it. The story goes that a few days after he was buried, mischievous Cadets snuck in to the cemetery one night and pulled the alarm’s cord sending the caretaker rushing to the General’s rescue. This prank happened on several other occasions and the bell was silenced forever by the West Point authorities. Nils H. Andersen, a troubled World War II veteran who was a patient at this facility, sculpted all the busts. He was not physically injured in the war but returned home with what is now termed PTSD and as a result, fell victim to alcoholism and a number of related illnesses and became homeless. In 1986, at the age of 60, Nils Andersen found his way to the Montrose Veterans Administration Hospital. Apparently, he had some artistic talent, so his therapist, Ms. Florence Quillinan, encouraged him to take sculpting as part of his treatment, and he made eleven clay busts of members of the various armed services. Andersen made several unsuccessful efforts to get the funds to have his sculptures cast in metal. Finally, help came from the estate of an 89-year-old veteran, Kathryn Poland, a World War I captain in the Army Nurse Corps who died at The FDR Veterans Hospital in 1983 without heirs and an estate of $36,700. It paid a portion of the cost of casting the sculptures. 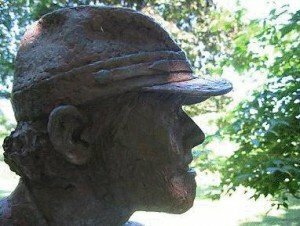 The first ten sculptures were cast in bronze in 1988 at Tallix, Inc., in Beacon, N.Y. Landscape architect Henry H. Liede, of Croton-on-Hudson, N.Y., generously volunteered to design the sculpture garden. It was dedicated on May 25, 1989, dubbed &#8220Nils Andersen Day.&#8221 Andersen, Marine Corps brass, hospital officials and hundreds of veterans were present. Nils Andersen died on August 2, 1993, in the Bronx (N.Y.) Veterans Affairs Medical Center. He was 67 and is buried in Calverton National Cemetery on Long Island. His studio was at 20 Everett Avenue in Ossining, NY where he created other sculptures. A bust of Gen. William Booth, founder of the Salvation Army, is displayed in a New York City Salvation Army shelter where Andersen once lived. The Montrose hospital also has three Andersen statues of homeless men in storage. These await some benefactor who will underwrite the cost of casting them in metal. For some unexplained reason seven soldiers from Salem and North Salem were not inscribed on the monument. They are Ezra Griffen -38th N.Y. Volunteers- Charles Gray-6th N.Y. Heavy Artillery- Charles Bailey, John W. Knapp, James Russel and Warren Spenseer-4th N.Y. Heavy Artillery. Mount Vernon’s eight foot bronze Standing Soldier statute stands in the “parade rest” at position Farnsworth Park on a triangular piece of ground in front of what is now Mount Vernon Hospital. The tablet on the front of the 10ft. granite pedestal reads “Erected by the Citizens of Mount Vernon to her loyal sons who fought for the Union.” The tablet in the back or west side has another inscription that says “To the noble women who, from home, hospital and field contributed to the preservation of the Union.” In this regard, it is the only Civil War monument in Westchester County and perhaps the State of New York that recognizes the invaluable role of women in that conflict. 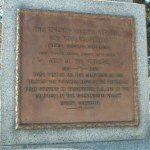 However, this tablet was not in existence at the time the monument was dedicated in June of 1890 and there is no record of when it was placed there and by whom. 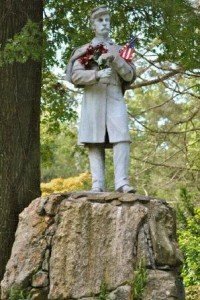 In any event, the monument came to be there largely through the efforts of Colonel Henry Huss a Bavarian immigrant who served in the battles of Chancellorsville, Fredericksburg and the Florida campaign. 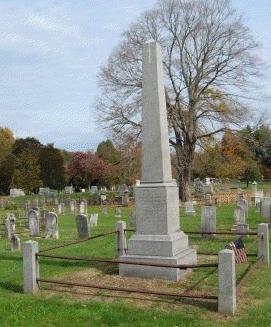 Following the War he was President of the City Board of Trade and deeded the plot that that accommodates the monument. Almost $2,000 was raised for the construction costs and on May 30, 1891, the statute was unveiled. Supposedly, a copper box is buried beneath the granite base that contains personal memoranda of the monument committee members, including a list of contributors several Civil War artifacts and a history of the New York Industrial Home Association No.1, the group that led the drive to incorporate the Village of Mount Vernon in the 1850s. 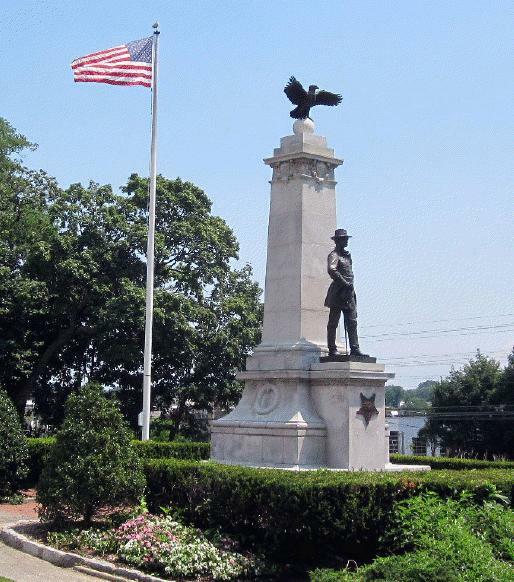 This is the Civil War monument at Greenwood-Union Cemetery, in Rye dedicated with much fanfare in 1888. The soldier is in the typical- parade rest position but the rifle he once clutched is missing. George Beck was the sculptor and the statute was cast by the Abendroth Brothers Foundry in Port Chester, NY. 10 years later, a plaque was added commemorating Newell Rising, a young sailor from Port Chester killed on the &#8220Maine&#8221 in Havana Harbor during the Spanish-American War. Standing the east grounds of the Manor Hall in Yonkers is the Soldiers and Sailors Monument erected under the auspices the Soldiers and Sailors Monument Association. 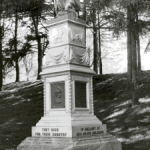 The monument cost approximately $13,000 to build Standing the east grounds of the Manor Hall in Yonkers is the Soldiers and Sailors Monument erected under the auspices the Soldiers and Sailors Monument Association. The monument cost approximately $13,000 to build and the money was raise by subscriptions from local individuals and organizations. The statuary consists of five pieces, representing the Infantry, Artillery, Cavalry, and Navy and there is an 8 Ft figure of a Flag-Bearer on top. Each one was from entirely new and original designs. The figure of the sailor and was designed by Lt. Washington Irving Chambers of the USS Petrel and the remaining three statues were designed by James Edward Kelly of New York City. Each of four bronze lower statues are 7 ft. feet high and were sculpted by Mr. Lorado Taft and cast by the American Brass Company of Chicago. The monument was commissioned Jan. 1916 and dedicated on Sept. 4, 1916 with a speech by Lt. General George B. Loud. He served as a Lieutenant during the War with Company D, 10th U.S. Colored Troops Heavy Artillery. The monument’s granite material came from the Jones Brothers Quarry in Barre, Vermont. It was once &#8220the largest granite manufacturing plant in the world,&#8221 and had over 600 employees and occupied 100,000 square feet of operational space until it closed in 1975.